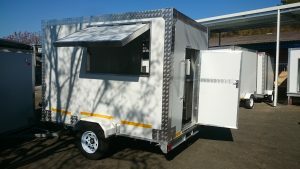 Mobile kitchens for sale are affordable prices in South Africa. A kitchen is a large vehicle equipped to cook and sell food all at the same time whilst still being very hygienic for your convenience. Our mobile kitchens for sale come standard with all the basic necessities that you will need to be successful in your venture. Our mobile kitchens can be custom made to your specifications if you desire it or you can purchase our standard design. Steel wipe down walls for heat-resistant interiors up to 500 degrees. Our mobile kitchens are number one when it comes to quality and design. We manufacture our Kitchens on a international level.